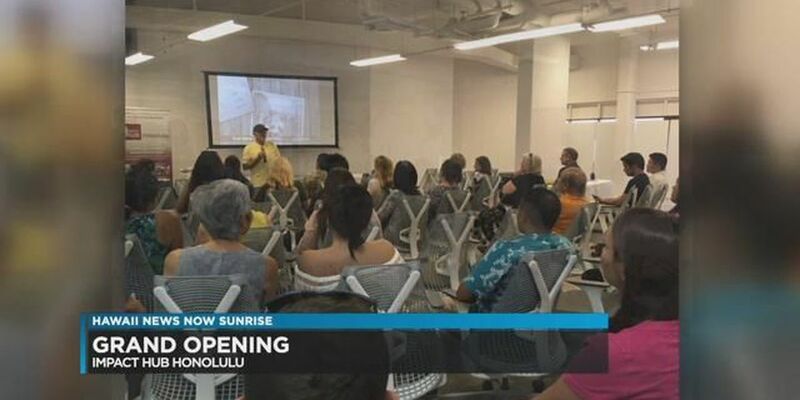 HONOLULU (HawaiiNewsNow) - It's time to break out the polyester and platform shoes as Hawaii's newest coworking space, Impact Hub Honolulu, celebrates its grand opening in groovy 70's style. Located in the heart of Kaka'ako, the disco themed event will be held on Saturday night, January 27th, from 7:00 to 10:00 p.m., and is a fundraiser for Aloha Harvest, a non-profit organization that rescues quality, donated food and delivers it to social service agencies feeding the hungry in Hawaii. Admission is free for Impact Hub Honolulu members, $30 for general admission, and $20 for 21-years of age and under (which include food and beverage scripts). The spacious Impact Hub Honolulu (located in the former World Gym near South Shore Market in Ward Village) offers entrepreneurs and small businesses a variety of coworking options in the form of offices, open and dedicated desks, and everything in between. The 14,000 square foot facility also includes a living room area, a napping nook, three meeting rooms, a communal kitchen, men's and women's locker rooms with showers, and a flexible open floor venue area. Overseeing Impact Hub Honolulu is a team of inspiring leaders comprised of co-directors George Yarbrough and Meeta & Nam Vu, and community manager, Anne Weber. Says George Yarbrough, "We are proud and excited to bring this level of coworking and community space to Honolulu and hope it will continue to attract an inspiring mix of entrepreneurs, digital nomads, remote professionals and inspiring organizations to make impact and build community." Nam Vu continued, "What we offer here at the Impact Hub Honolulu is on par with coworking communities found all over the world. Our desire is to bring that excitement, impact, and sense of partnership to Hawaii." Added Anne Weber, "Partnering with the wonderful and hard working team of Aloha Harvest is a perfect match! We can be true to our commitment to sustainability while celebrating with our growing community and bring attention to their mission of rescuing food for the hungry." One hundred percent of the net proceeds raised at the grand opening event will go to support the cause of Aloha Harvest of Honolulu. Says director, Ku'ulei Williams, "I am excited and energized by what the Impact Hub Honolulu will bring to our city and all of the possible partnerships and programs to come in the near future." The Impact Hub Honolulu grand opening event will include upbeat music by Taylor Fujimoto of Swingin' Bananas/KTUH Radio, Lucie & The Perfect Wave, and DJ Rhombus & DJ Righteous Rob. Makana Market & Deli will provide delicious food, as well as hearty salads from Juicy Brew, while beverages from Lei Wine and Kona Brewery help to wash it all down. Guests can purchase $5 raffle tickets for a chance to win several prizes from HI Sketchfest, Dream Float Hawaii, American Savings Bank, and Airbnb to name a few. Donations can also be made directly to Aloha Harvest at the event in exchange for a funky light up ring, perfect for standing out at the disco. A special prize will go to the best-dressed 70's disco themed outfit too.